” – Challenging people in order to help them. 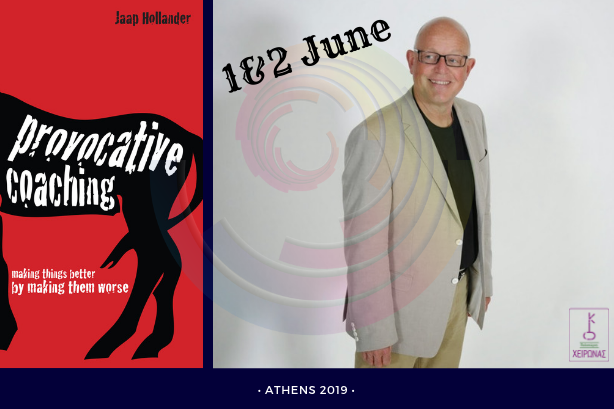 Jaap Hollander is coming to Greece on June 1st & 2nd for a 2-day intro course in Provocative Coaching! Provocative coaching offers some new possibilities that you won’t find in ‘traditional’ coaching or therapy. And yet it harnesses forces that most people will recognize intuitively. To understand one of its basic principles, think back of a moment in your life when you really wanted to do something, and someone said: “That’s too difficult for you”. Or maybe they said, “You are too old for that” or “You’re too young”. It doesn’t matter what their reasoning was. They might have just said: “It isn’t you!” Can you remember a moment like that? You really wanted to do something and someone important told you that you couldn’t. What was your response? Most likely, it was something like: “You think I can’t do that? We’ll see about that!”. “I’ll show you what I can do!” And so, you ended up even more determined. Provocative therapy utilizes this kind of energy. It differs radically from ‘classical’ types of therapy like psychoanalysis, cognitive therapy, client centered therapy, or even from the newer approaches such as neuro-linguistic programming (NLP) or solution focused therapy. It challenges people in order to help them grow, rather than trying to help them directly. Three things make provocative coaching attractive for helping professionals. ➊ Provocative work can be surprisingly fast and effective. ➋ It can work quite elegantly with clients who don’t do well with conventional change work. Jaap is co-owner of the Institute for Eclectic Psychology, IEP, together with his wife and colleague Anneke Meijer. The IEP is Holland’s oldest NLP institute (13.000+ people trained). Robert Dilts has been teaching for the IEP for 35 years. He authored eleven books, amongst them ‘Essentials of NLP’ (Dutch, with Lucas Derks), ‘Provocative Coaching’ (English) and ‘Trance and Magic’ (Dutch, about modelling trance rituals in Brazil). He was on the Dutch Quote top 500 business advisors list for as long as it existed. He is a member of the NLP Leadership Summit. Jaap studied with the founder of provocative therapy, Frank Farrelly, for more than 25 years. He developed a system (called the ‘Farrelly Factors’) for teaching provocative coaching. In the Netherlands he teaches a one- year training course in provocative coaching together with Jeffrey Wijnberg. Jaap teaches mostly in the Netherlands, but on occasion in other countries too, like Poland, the USA, England, Mexico, Colombia, Russia and, from Jun 2019, in Greece.